In many homes, a kitchen doesn't just offer cooking space – it's also a room where people gather and where families talk to each other about their day, do homework, etc. For this reason, it's critical that a kitchen is both comfortable and functional, no matter how much square footage is involved! If you're looking at a tiny kitchen, don't despair! 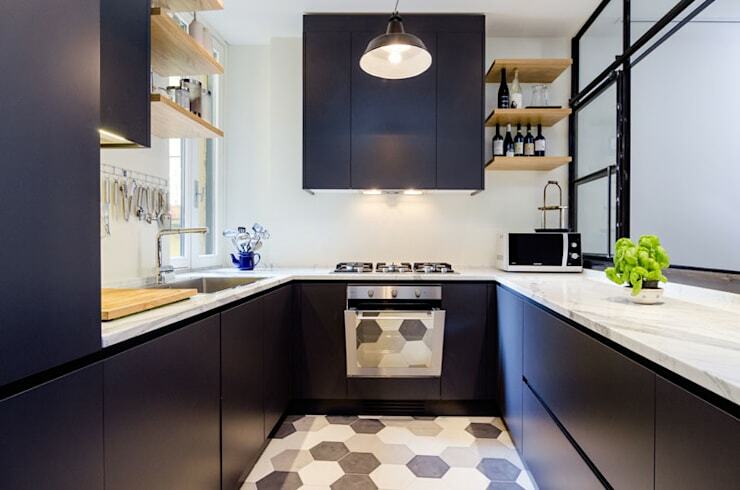 Here are 6 well-designed kitchens that fit in spaces no larger than 40 square feet, offering functional and friendly designs. In oddly-shaped rooms, you can take into consideration the idea of exploiting the space in a small niche, enclave, or corner, like this example by architect Marie Antoinette Canepa. 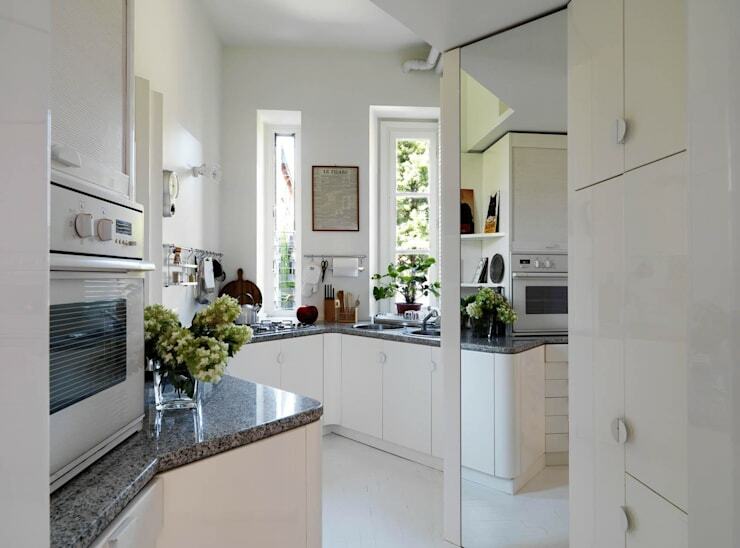 This small but charming kitchen has been given a little extra reach with this narrow corner extension, fitting in an oven and wall of cabinets for additional kitchen storage. Playing with dramatic shades of black and gray, this industrially inspired kitchen by U Nomade Architecture in contained in a compact space, but its dynamic design allows for all the creativity and freedom you could ask for in a kitchen – small doesn't have to entail cramped , as this example proves!. 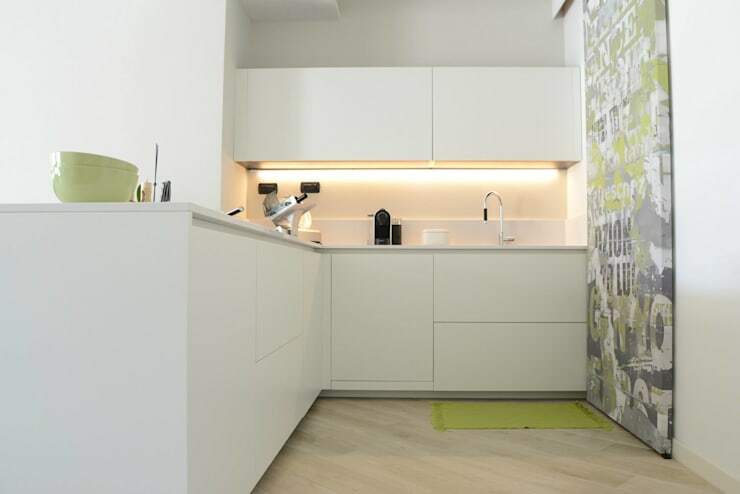 Plenty of thought has been given to work surfaces, as the wide white countertops reveal, and the large seamless cupboards offer more than enough storage. To make this kitchen as functional as possible, open shelves provide space for more frequently used items like oils and spices. The result is a functional and welcoming environment which gains a sense of openness through the glass partition on the right that lightly separates the kitchen and the living room without completely closing off the space. If there ever was an ideal style for decorating a small kitchen, minimalist is it. Minimalism allows clean lines and simple forms to characterize the space, leaving the atmosphere clutter-free, airy, and refined. 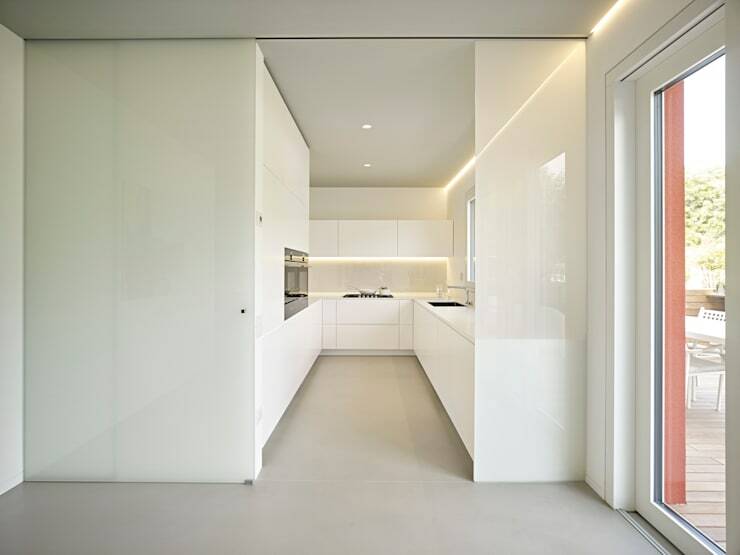 This totally white example from Burnazzi Feltrin architects takes a narrow space and transforms it into an immaculately clean and polished cooking space, with the long horizontal lines of the counters serving to exaggerate the room's length even further. So often, small spaces within a home can feel heavy, dark, and static. 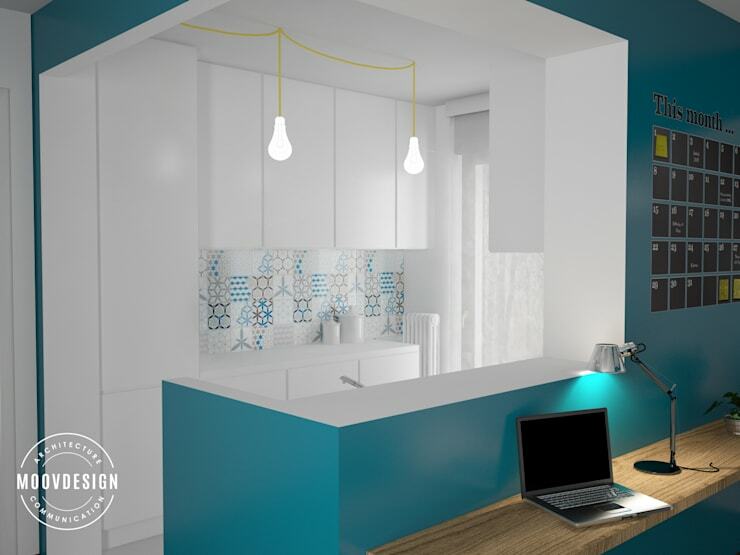 This kitchen, although tiny, portrays a sense of vitality with a lively teal wall colour, playful mixture of patterns in the backsplash tiles, and crisp white lightblubs. It's hard not to feel upbeat in this high-energy space! 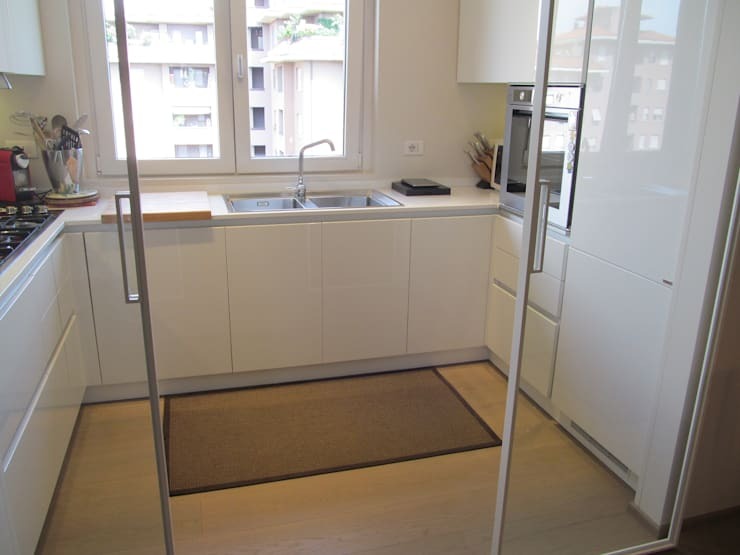 It's often young singles and couples who end up with tiny kitchens in their apartments. Interior designers from LTAB/Lab Studio have created the perfect kitchen for a anyone looking for a youthful, modern kitchen atmosphere. The standout element of this room is the patterned wall canvas which can be pushed aside to reveal a storage area full of kitchen appliances recessed into the wall. This compact kitchen distinguishes itself with its elegant design, offering a com positioned that's tasteful and balanced. Despite its small size, the space is surprisingly well lit due to the placement of two sliding glass partitions instead of heavy solid walls, and a centrally located window. With a well-placed sink enjoying neighborhood views, this elegant space provides an enjoyable work environment. A double basin sink, along with an unexpectedly large stove and fridge column, makes this a highly functional kitchen space as well. For more kitchen inspiration, have a look at this ideabook with three drastic kitchen transformations! What do you think of these small kitchen designs? Comment below!